Do you think it’s difficult to make them? The answer is no! To make mini tarts is a bit difficult. You need to prepare the dough, roll out and cut it, and put the dough into mini tart cake molds… But my recipe is pretty simple because I use round shaped cookies for tarts instead! 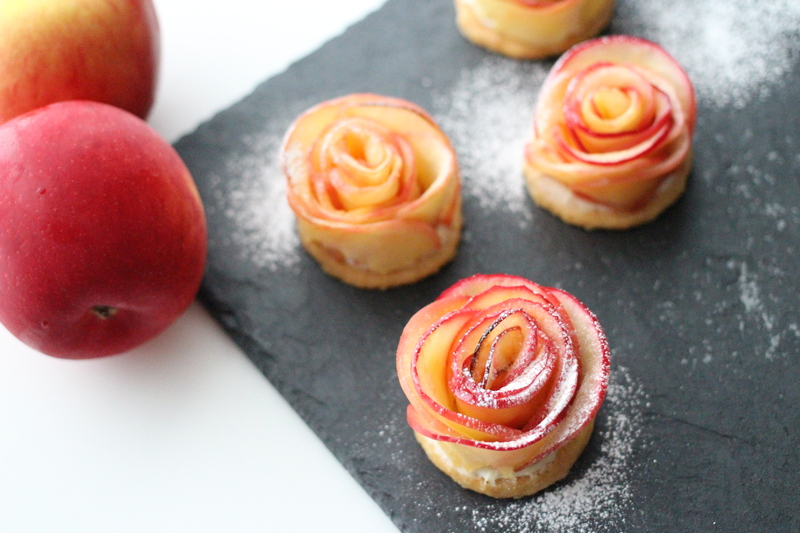 To make a rose shaped apple is also not difficult! You can check the YouTube video, you will see how to make it. I like serving these lovely tarts with coffee or tea when I have guests at home, everyone would be surprised at how beautiful they are! Put the room temperature butter and powdered sugar in a bowl, whip them together. Try to make the butter airy. Add the flour and mix them with a spatula. Make a baton shape on a piece of plastic wrap, wrap the dough up and chill for 1 hour. Slice the dough into about 5 mm sized pieces, place them on the baking tray with baking paper. Bake at 160℃/320℉ for 15 min. Cut apples in half, remove the core and slice them. Place the slices of apple on the baking paper overlapping each other. 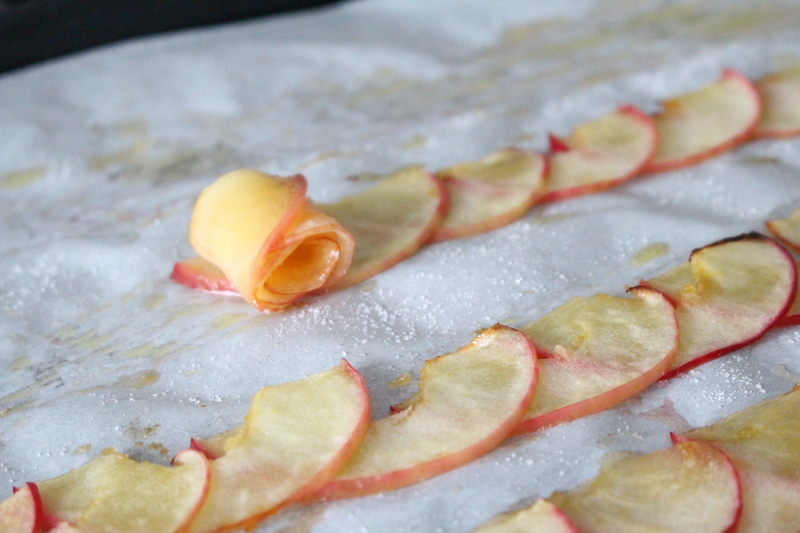 Gently brush the apple slices with melted butter and sprinkle sugar on top. Bake at 200℃/390℉ for 8-10 min. After the cookies cool down to room temperature, spread a little melted white chocolate on the surface of the cookies. It prevents them from losing their crispy texture caused by the raspberry jam. Then, put a little raspberry jam on the cookies. 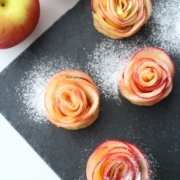 Gently roll up the overlapped apple slices to make a rose shape and arrange on the top of the cookies. Sprinkle powdered sugar and serve them. Choose small apples and slice them as thin as you can. The rose shape will be more beautiful. Don’t mix the dough too much after you add the flour. The cookie will lose its crispy texture. You can use brown sugar instead.